OK, I've made it through Holiday and moving insanity 2007! I flew in to Newark late night Sunday the 16th and worked from the Opsware NYC office most of that week. 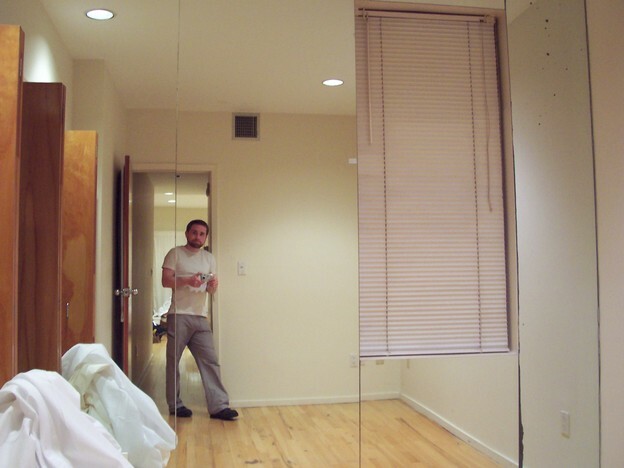 I was staying in my Hoboken apartment and trying to coordinate a bunch of logistics. I also had some NYC errands to run including getting my alto sax regulated and getting my watch repaired. Oh yeah, and I still had a good bit of Christmas shopping to take care of. The following Saturday my Dad drove out to Hoboken and we loaded up his car with some of the final remaining personal belongings I had in storage in the basement of my Hoboken apartment (books, scuba gear, etc). Saturday afternoon/evening I went with my parents to two movies back to back: The Kite Runner then Charlie Wilson's War. Both were well done. Then began the holiday feasting. Sunday we were at the Zippis for the December birthdays. Monday Christmas Eve we were at Kate and Steve's, and Christmas at my parents'. It was lots of good food and good fun. Sunday I played some of the Bach cello suites I've been practicing at the party. Wednesday morning we had pancakes and conversation. When Frankie mentioned that "Hanukkah was done a week before Christmas this year", Mom chimed in with "Who's Annika?". Then I took Mom's car back to Hoboken for the last minute fire sale of all my furniture. So I blasted out about 10 craigslist ads and begun coordinating with lots of strangers to sell my stuff. Thursday and Friday involved lots of craigslist emails and calls, selling some stuff, and lots of packing. Unfortunately I was unable to locate buyers for a lot of my furniture. I was worried that I would have to rent a van on Saturday and haul a bunch of it to my parents' house. However, after conferring with Chris and double checking the Hoboken garbage policy, I determined I could put pretty much any furniture out on the curb Friday night after 9pm and the trash guys would take it. So thus in earnest began the great "beasting" of my furniture out to the curb. This consisted of a 2-piece sofa, a queen size mattress and box spring, a dresser, a cabinet, and a book case. See the Urban Dictionary definition number 9 for the verb "to beast". Basically, I'm using this verb to describe the process by which a single person gets all that furniture out of his apartment, around a narrow awkward corner, down a flight of stairs, and out 2 doors to the curb. So after a while of that and a penultimate loading of miscellaneous boxes of stuff into the car, I drove back to Lambertville to sleep being as my bed was now out on the curb in the rain. 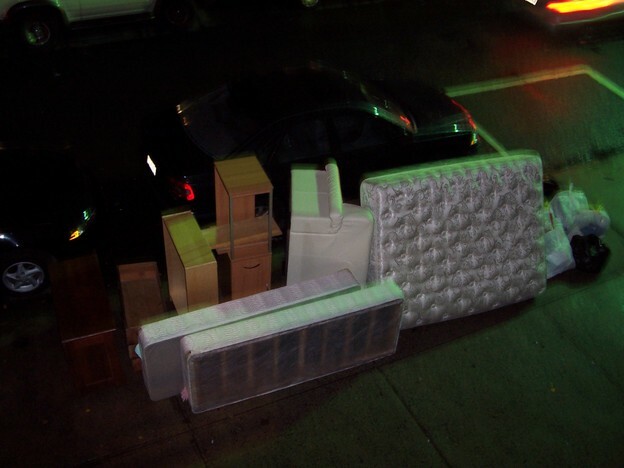 I was nervous about getting fined because the information I had seemed to indicate I might have needed to call ahead in order to throw away all that furniture, and also that I needed to wrap the matress and box springs in plastic, neither of which I had done. Since at this point it was just very mildly drizzling I wasn't too worried about the plastic since the garbage collection would be happening shortly anyway. Of course, as I set out toward Lambertville, this changed to an all out downpour. Sorry about that, garbage collection folks. Here's me just after the beasting. By chance on Saturday I checked the mail at my parents' house, and I found that my extra keys had arrived from Boston. 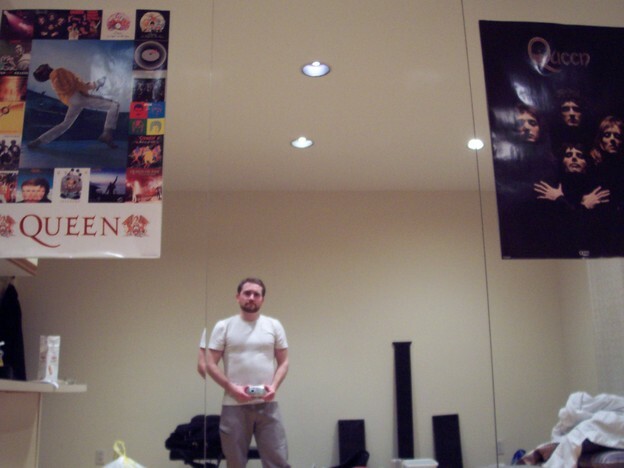 So I went and shipped them off to the new tenant and purchased a poster tube which meant my beloved Queen posters would survive the move. The spoils of a good beasting. Anyway, I was greatly relieved that I didn't have to rent a van/truck. I drove back again Saturday morning to meet the person who was buying my coffee table - the last piece of furniture in the apartment, and do the final sweeping and cleaning. Once that was taken care of I headed in to the NYC office to rest up a bit before meeting Chris to go watch UFC on the big screen at Madison Square Garden. First we had a very nice meal at a cafe on 23rd street. Then on the way back I gave Chris my stereo from my apartment and left the keys inside and completed the final exit. I enjoyed my stay there for the past two years. Then another long long drive to Lambertville and much needed sleep. Sunday morning a friend of my parents took me to the bus pickup point and I took a long, crowded bus ride to the airport. I flew out to Denver, got a bus to my car at the parking lot, and drove to Boulder. My Aunt, Uncle, and two cousins had also just flown back from Mexico at the same time and arrived back in Boulder just an hour or so before I did. So I stayed with them Sunday night and Monday for their New Years party. I also played some Bach cello suites - at this point I've covered pretty much all my Aunts and Uncles except for Jane and Dennis with Suite No. 1. Next time it will be the more brooding No. 2. Today after blueberry pancakes for breakfast I drove about 5 minutes across Boulder to the house I've rented for January. I met the owner and the two cats I will be cat sitting - Samui and Phuket (islands in Thailand). So now I've moved in and stocked up on groceries and looking forward to just enjoying a few moments of calm before I have to again search craigslist in earnest for February housing (hopefully in Park City, Utah). More photos of the new house and the kitties tomorrow.